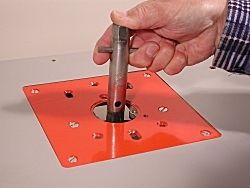 One of the problems of using a router in a table is that it can be difficult to insert and remove cutters. For narrow cutters such as the smaller diameter straights and trimmers, a box spanner makes the job easier. For medium-power routers, a 17mm collet nut is the most common size. For larger routers, a 22mm nut is most common. If you have difficulty finding box spanners of these sizes try your local motor spares shop. The photo shows a straight cutter being removed from the collet of a Trend T5 router.